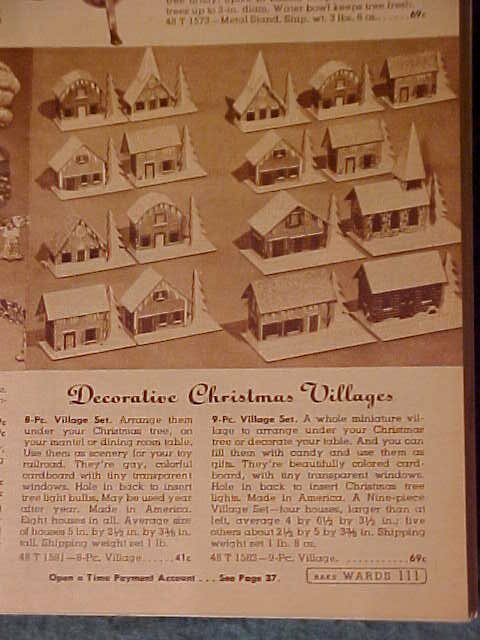 Christmas Village Putzes and train layouts during World War II. At the time the Japanese attacked Pearl Harbor, she was just out of high school - working in one of the better known 5 & 10's. Monday morning Dec. 8 she came to work as usual, an hour before the opening of the store. The manager came down and addressed them as a group and said: "I want you to take everything in this store marked Made in Japan. I want you to put up tables out in front and pile it there. I want you to put up a sign saying "Free to Anyone Who Wants To Carry This Away."" My current "best-guess" on the debut of Dolly Toy Houses is about 1938. Chronologically, that would be correct for "Pre-War,", but it isn't right for the feeling of this period. 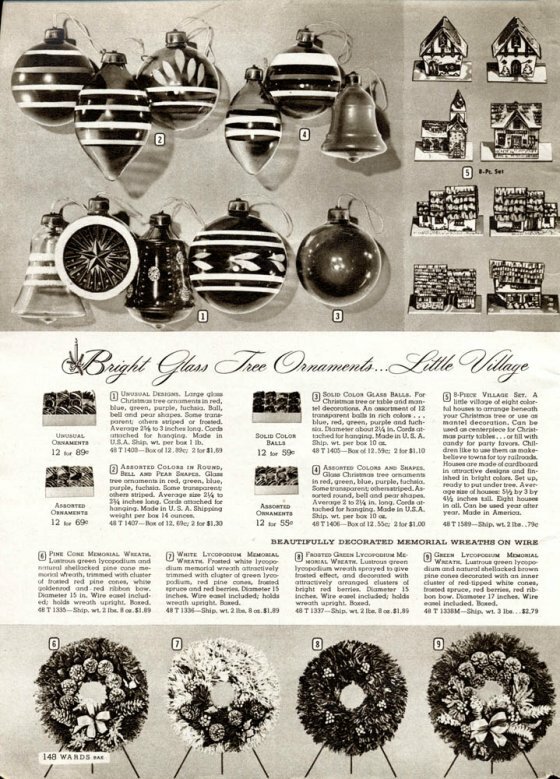 These American-made mass-produced things are of the War -they don't fit either aesthetically - or politically - into the innocent Christmas oppulence of the '30s. They were all you could get for "The Duration" and years after... up until the mid-'50s when a few large and elborate Japanese houses made a brief resurgence. Shown are some "Colmor"printies - not to be confused with the Japanese "printies" of the late '20's, and some of the products of the Dolly Toy Company and their "printies." The creased cardboard trees - replacing the Japanese supply of wound-chenille trees from the late '30s - and which are typical American Wartime and the general manufacturing style would seem to support a Dolly Toy - Colmor" connection, but they were entirely separate entities. No connection. We have a fairly good history on Dolly Toy, but try as I may, I can't find much history on Colmor. They were a two-bit cheap novelty company that made a lot of cheap things. (Much Like Dolly Toy! - but less documented.) It seemed, at first, there might be a connection because their houses are often advertised close together in time - catalog ads of the same years, and there are some general aesthetic similarities like these which really only reflect the times during WW II, but it's really only a matter of that and nothing more. 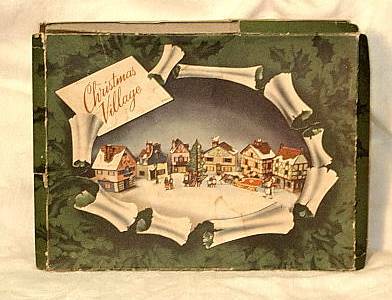 I don't have a 1940 "wishbook" from either company, but I do have a 1939 Ward's, and absolutely no houses are offered. None whatsoever. 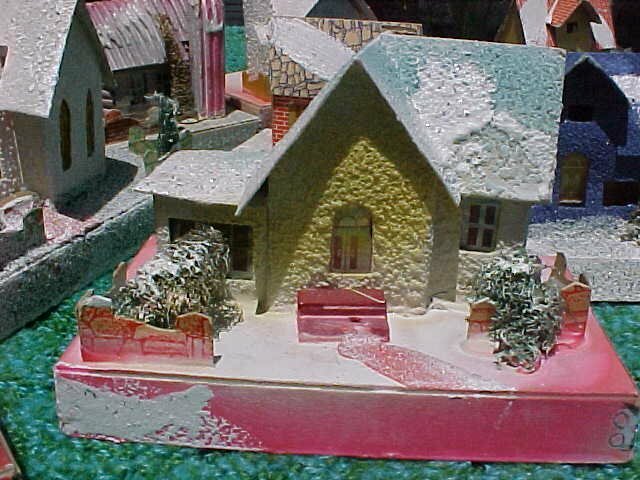 I don't know exactly when the Dolly Toy Company started making their simpler, best known Christmas houses, but preWartheir pre-1940 stuff was rather interesting and quite pretty - originally quite colorful, in soft pastels. If you can find them clean and well preserved, they are well worth collecting. I think this reflects their innocent beginnings before the looming War had taken the consciousness of buyers and manufacturers. From 1941 on, the less fancy Dolly Toy and Colmor are also quite plentiful - being virtually all that was available during WW II - but hard to find in nice condition. The inks have faded and grown dull on their printies, and their method of manufacture with deep die-cuts at the corners and unpainted edges have given them poor wearing qualities. They come apart after relatively little handling; the edges separate and fray. One is lucky to find those which were forgotten and neglected. Still, if that's what happened to be underneath your tree as a preschooler (it's what we had) you will want to have some just the same. 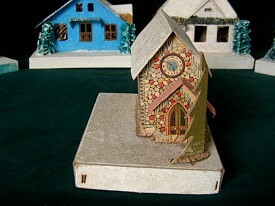 The designs were limited in number and detail, but they had the most charming paper doors and windows! Selection of <>Pre-1940 Dolly Toy. When found in like new condition, the preWar DOLLIES can be quite lovely and worthwhile, with their soft pastel rainbow hues. The texture is very rough: coarse flint grint - literally coarse flint sandpaper, or very possibly crushed oyster shell, which was (and still is) extensively used to create texture in wall paints and plasters. Likewise, in fine condition - Dolly's preWar Printies can be quite nice, too. 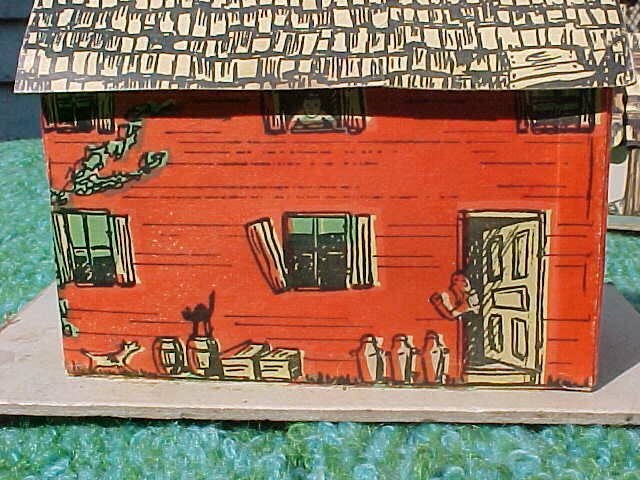 Note the windows: ink -either gold or silver - on translucent red tissue, unlike the WarTime and PostWar two-color lithos on white paper that are so familiar to us War-Babies.Note, also, that this is EXACTLY the same house as the one in the picture above, except for the finish. A fairly representative selection of Dolly Toy and Colmor WARTIME PRINTIES. Ca. 1940-'41 until dyeing chemicals came into short supply during The War. I hear Glenn Miller music whenever I find these. So characteristic and in harmony with the styles and youthful spirits of that brief time. These really "swing!" Dolly Toy, made this basic set of eight in this same box from just before WW II until they stopped production in the early '50's. This same set of designs can be found in several finishes, from colored plain tinfoil to glass bead on foil to multicolor sparkle on plain white cardstock to the absolutely stark, white unadorned cardstock from the depths of The War, when not even the tinfoil could be spared from Defense Production. Sets of PRINTIES can also be found in this same box. Shown are the last of the series: - very late 40's / early '50s - as can be ascertained from the fact that the bases are styrofoam, rather than the usual flimsy cardboard open box-style with the corner-rivet staples. Ya gotta forgive them, they were doing the very best they could. I mean, at $.98/box - how many did they have to produce to buy a hamburger for their kids? Typical WarTime piece, of plain white cardstock. 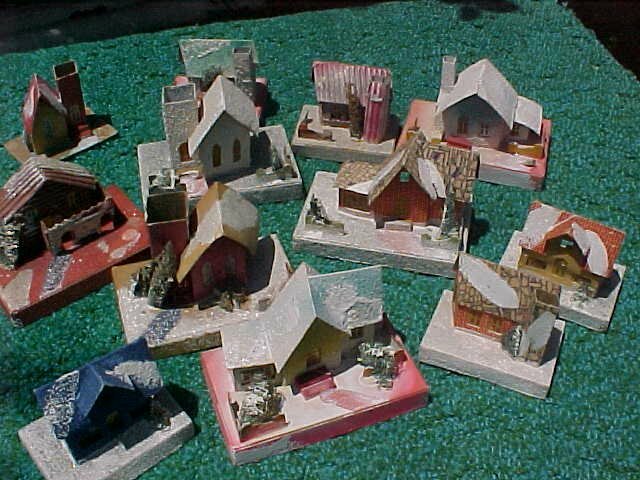 Most everything you could get during WW II was vehemently stamped "Made in U.S.A." and Dolly Toy was not consistent, but did stamp their name and address on their pieces and sets often enough to make them one of three identifiable manufacturers in the history of Christmas village houses. 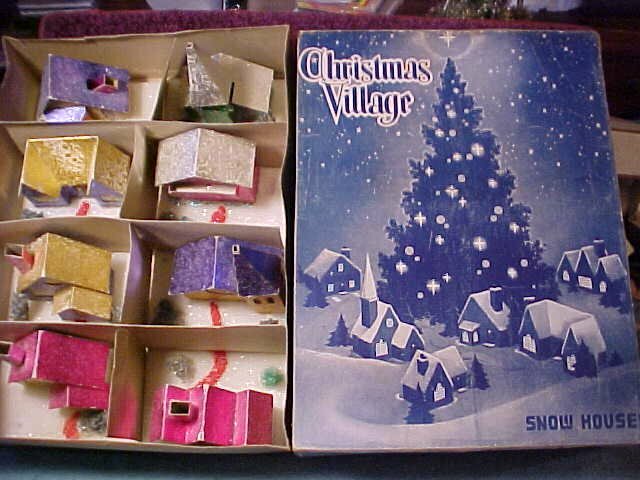 Though they hadn't made Christmas village houses in over 50 years, the Dolly Toy Company just closed their doors in December of 2008. A company called "COLMOR" made these little printies, I am only 99.999% sure. "Colmor" is a trade name based on the idea of "More color," and there are strong reasons to believe they were an offshoot of the Dolly Toy Company. The windows are unlike Dolly Toy, but somewhat like the American "Dollies" is the highly detailed, if seriously more "kitchy" lithography. You see them in moderately larger sizes, too. I'm sure they're War-Time. And postwar for a while. They have that early '40's style, but I really just couldn't prove it... Search engines have produced many references to a ghost town "Colmor" in New Mexico, but nothing on either "Colmor" the house maker, or the Dolly Toy Company, while millions of their products are still to be found at flea markets and in the junk shops. There are features to be found on both brands that lead me to believe they were made by the same company, such as the base construction and the characteristic creased cardboard pine trees in the yard. 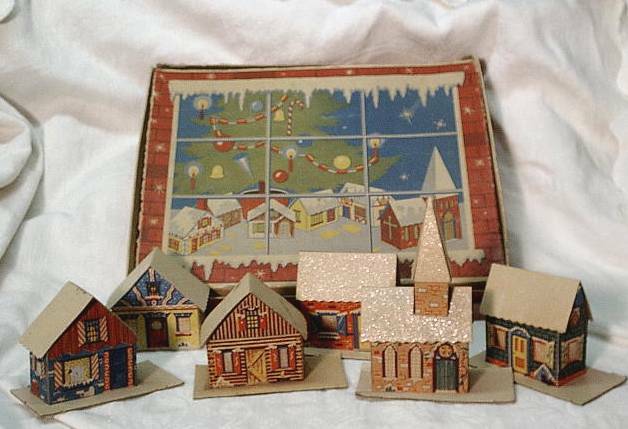 Incidentally, only "Dolly Toy" and "Colmor" actually used flaked mica to achieve the "sparkle" effect, which has led many to describe all carboard houses as "mica," but it wasn't true for any but the American Christmas decorations. The Japanese used shredded cellophane, natural silicates and ground glass to obtain their "glitter. " The flaked mica "artificial snow" we shook on our displays and trees has slowly faded from use, probably because it was such a mess to clean up after. Tom Hull has contibuted the photos and commentary below. These are sets he's had in the family since childhood, and although they obtained them just after The War, these are so typical of what you could get all through The War as well. 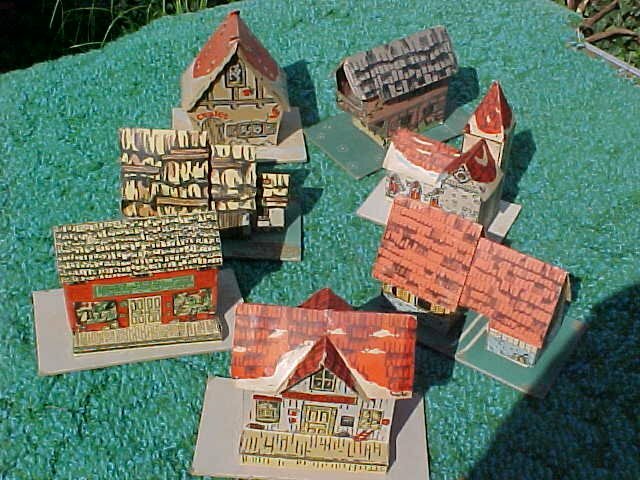 Cut-out kits such as the "Merry King Cole and his Fiddlers 3" shown below are so characteristic of the kind of toys kids got for "the duration" and for quite a while thereafter. ""The below illustrated houses are marked Colmor on the backs. 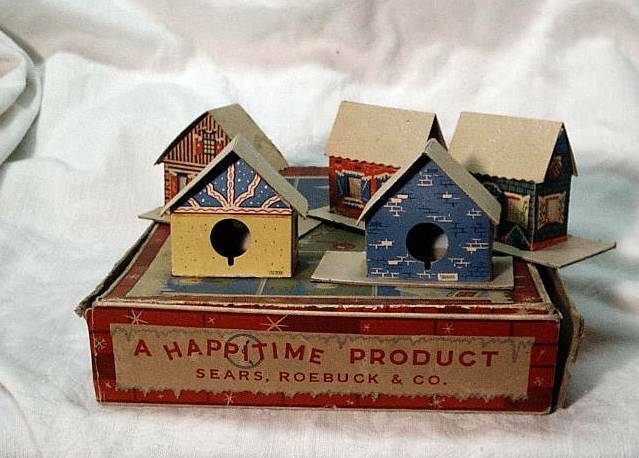 These were sold by Sears under their Happi Time brand.No date or even how many were in the set but the box could have held 9 of these houses. We had a Colmor set and I believe we got them in 1947. Colmor made a number of cheap toys and decorations. I have seen ramp walkers, and numerous b-b puzzles and some Easter stuff including a paper bunny pulling a cart in cardboard and a tin decorated egg candy containers. This illustrates the only styles that I have seen that are definitely Colmor. It seems that Colmor did make some small tin toys, too. One wonders how they could have competed with Japan, and during The War they wouldn't have had to. They seem to have filled a toy-niche' left vacant by the Japanese. Afterwards I'm sure it was a different story. This probably explains their disappearance. "Last night, I spent more time on your fine website, Ted. Then I checked out some things on the Internet. It appears, from what I found in varioius places, that Colmor, (of Colmor Toys) stands for Coleman & Morris. I also ran into Coleman & Morris Inc. They were listed on one site as being from Port Chester, New York. This toy company made tin Easter eggs, a Bango Band Toy Drum Set, a Spike Jones Trap Drum Set (1951) spinning tin toy tops, a plastic xylophone in the 1950's, and some other tin toys. Apparently Port Chester, NY through the years, was known for its iron industry and I suppose there's enough of a tie between iron and tin to understand location. 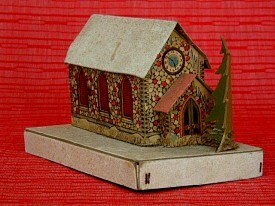 In any event, perhaps more clues may be found in "American Tin Litho Toys" by Lisa Kerr (Collectors Press). I don't have this book to see if Coleman & Morris is included as tin toy manufacturers. Perhaps also in the Ohio Art and Chein collector books Coleman & Morris may be mentioned. The books and articles I have about tin toy manufacturers are too specialized, mostly on Ohio Art and Chein. You or one of your vast number of friends may have tin collectibles books to research. Hopefully, this is a lead for you to track down your mystery cardboard Colmor houses. I don't know if the Coleman of Coleman & Morris is any connection to Coleman lanterns, or the two sister Colemans in the doll world. When you get on the site, scroll down past Ohio Art etc. and at the bottom of the short page, you'll find the Colmor name and company and you'll see the top close up by clicking on the thumbnail photo. Perhaps this "top guy" can tell you more about the Coleman & Morris company also. Hopefully, this is of some help to you." - T.B. There is a period of two to three years just at the close of The War that almost needs a category of it's own. The domestic life remained chaotic for some time. I know my Dad could not get a new car 'till 1948. The War did not end like a movie: it took the rest of the '40s for things to start to come around. Housing was a huge problem. Perhaps the preoccupation with so many cut-and-paste assembly sets reflected this. 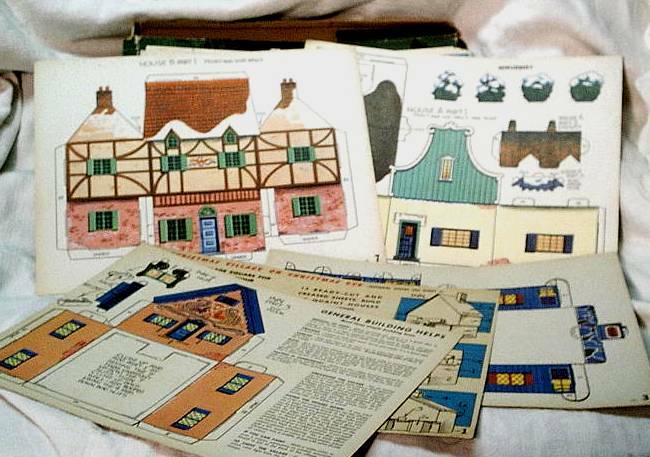 Tom Hull and I both recall a lot of cut-out-and-assemble toys in our 1940s childhoods. 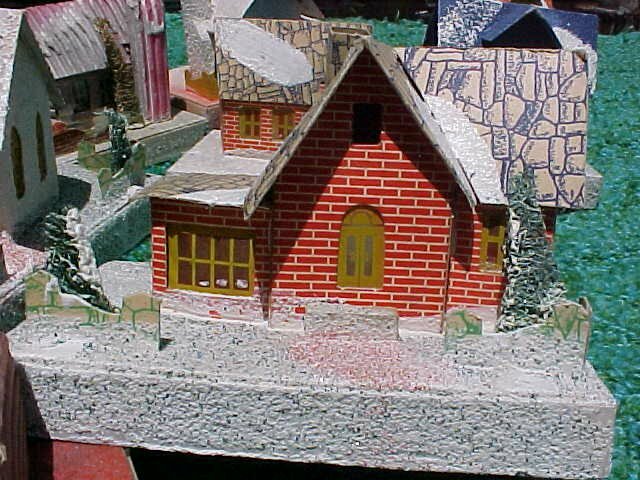 "The following photos illustrate a pre-cut put together kit of a set of houses. Many cut-out assembly toys arose during WW II. Though there is no copyright or date on this I suspect it was probably right after WWII. There are two different types of kits of these houses. 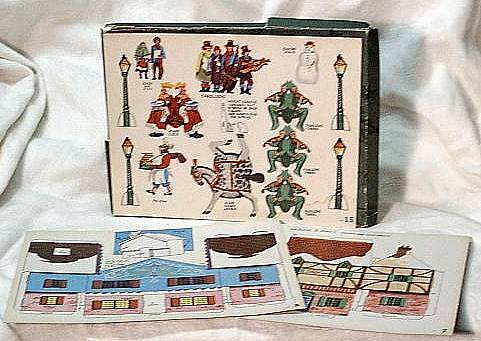 This set is usually referred to as the "King Cole" set as it features King Cole and his fiddlers three as paper figures as well as other nursery rhyme characters. There is one other set and I have it in both built and un-built form. I could get photos of them to you if you think you could use them on your site. The other set has the designer name on it but no other info. No publisher or anything. Curious. These are obviously American made and if I had seen them when I was a child I would have gone for them in a big way. I was given a Built-Rite Circus when I was 5 and though I had a hard time getting it together and wasn't able to get some of the more complicated pieces together I always had a fascination with anything of this sort. Still do I guess." Even Lionel put out a now-famous-with-collectors Paper Train set for "The Duration". Engine, cars, track and everything which, by all reports, was impossible to build. Oddly, you can buy reproductions of this nightmare today. Cut-out cardboard assembly things were very big in WW II, and this continued all through the '40s and well into the '50s. I have had considerable debate with myself whether to assign these things to WW II or "POSTWAR. "Prior to The War there were always paper dolls and cut-out toys, but Wartime material shortages really set them into big-time motion, so I've put them here. Just bear in mind they belong equally to both eras. I know I spent a lot of my 1940's childhood cutting out and pasting things like this together. Great stuff when you were quarantined at home from school with the mumps or chickenpox or measels! 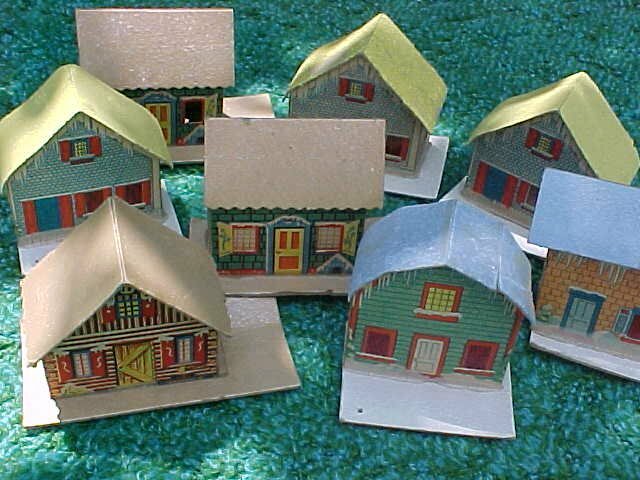 Cereal-box premium houses were a phenomenon of the War and PostWar '40s, too. 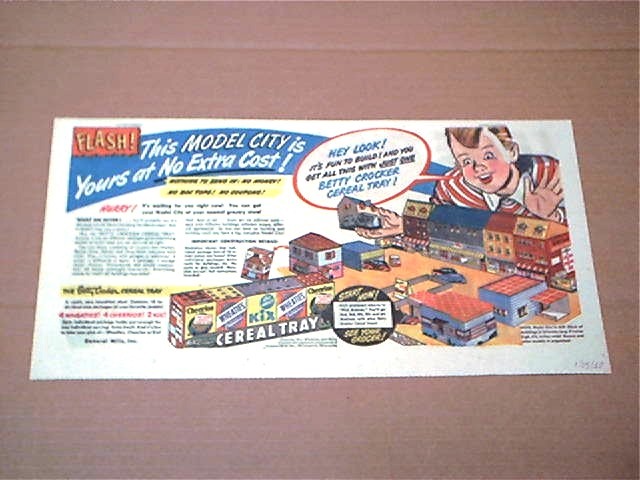 At least two cereals issued whole series of little cardboard buildings printed on the box to cut out and assemble, enough to assemble your own HO scale town! I don't remember the Betty Crocker series shown above, but both were the same sort of thing. My strong personal recollection is of those put out by Nabisco Shredded Wheat. In my kindergarten days(1946/'47), the shredded wheat came in stocky, squarish boxes with (I think) a dozen large biscuits inside arranged in layers of 4. 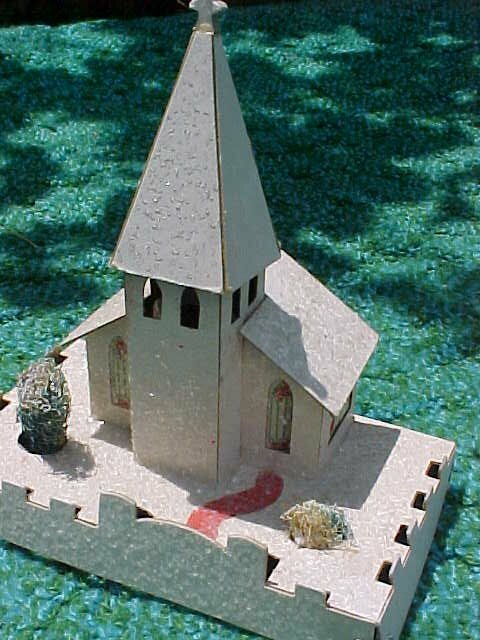 The layers were separated by flat sheets of cardboard upon which the parts for the little buildings were printed. They weren't punched - you had to cut them out with scissors or razor blades and glue them. It took considerable skill to do them well. Even so, they were quite popular with kids and grown-ups alike. These were the days when kids built things! Flying model airplanes. Crystal sets and one-tube radios. Erector sets and tree houses. My best-buddy's older brother up the street had an entire ping-pong table covered with his little city, and you did see them under Christmas trees every now and then. I have been looking for these at swap meets, antique shows, and eBay - but have never turned one up. While on an Internet search, I ended up on your most interesting website and was reading some things you had to say. I too recall as a child the Nabisco Shredded Wheat "dividers" that separated the pillows of cereal. Apparently various things were printed on those card dividers, but the little village series totally charmed me. Some years ago, before eBay, I managed to find a near-complete set of the cards at a doll show in Las Vegas, NV where I live. "Here is a bird's eye view of a complete Toytown. Three cut-out cards in each package of Nabisco Shredded Wheat. Duplicate cards will allow greater variation in setting up your own Toytown. Start now and join the fun. Good luck -- and good eating!" The layout and all cards are "line" drawings, with enough detail to carry the concept portrayed. To give you an idea of size, card no.1 which is titled "Rose Cottage", is 2 13/16's wide, 1 1/8" deep, and about 2 1/4" high from bottom to top of chimney (peaked roof). 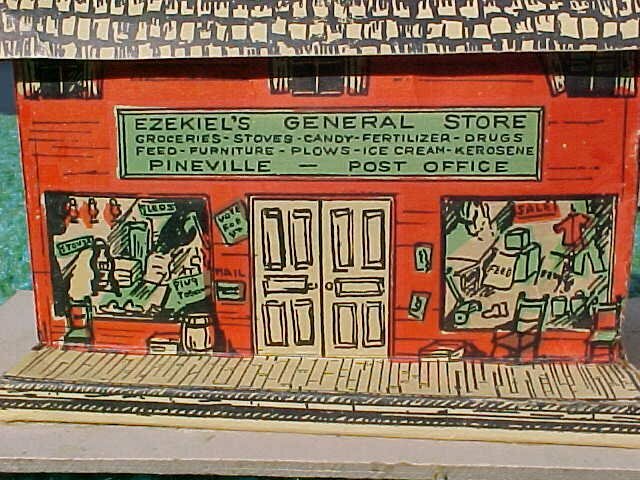 There are houses with people printed on them here and there with some of their pets, a barn, church, general store, post office, railroad station, etc. From the various activities of the people, it is apparently summer time. One card is a station wagon -- with wood panel sides, but the color guide says to color the wagon "deep yellow". There are also some trees to cut out and set up, and several other vehicles including a bus. There is also a monument on a base which measures 3 1/8" top to bottom. Anyway, I thought you may be interested in this information. I am a person who has had a life-long delight in miniatures, and just love train layouts. 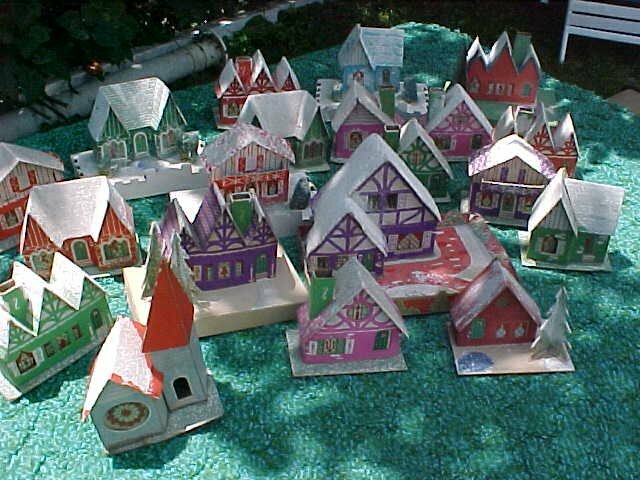 When I was a little girl, my uncle had an elaborate layout for Christmas and it included some of the glitter-dusted "paper" houses shown on your site. It's really nice that you are sharing the photos (and music!) on a website. Unfortunately, I'm on webtv. which is not a computer and I have no access to anyone with a scanner. Best wishes to you and yours. Sincerely, T.B." Thanks, T.B. This is great. Sure wish we had more pictures! 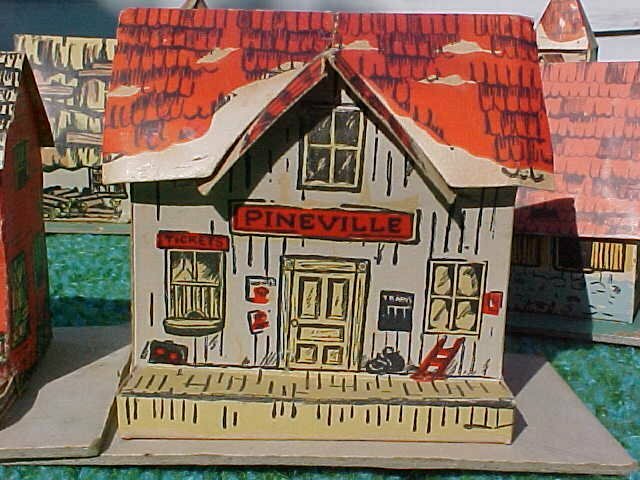 I call this The Pineville Set because that is the name on the train station. There are no other identifying marks on these pieces. Not even country of origin, but I am 100% sure they are American. It was 1946. Johnstown, PA. Christmas. The tree and village already up. I was quarantined at home from kindergarten with measles. (There was a "QUARANTINED!" card tacked on the front door. They did those things in those days. ) Brother Jim was just over a year old, crawling and scooting around enough to do real damage. Mom came home from downtown errands with a set of these. She was delighted as we put them under the tree - the first replacements she'd been able to get for our plain old wartime DOLLIES, which had gotten pretty shabby by that time, doors and windows all punched out by little punchy-fingers (guess who?) -sat on, spilled on and just generally played to death. I loved 'em! We had 5 pieces. I didn't discover that more existed (the long, 2-story barn-like structure in the back row, and 2nd version of the "Chalet"until about ten years ago.) It's an odd mix, this! You have, on the one hand, thatched-roof English or European farm buildings, a Swiss "Chalet," and the American comic strip "Lil' Abner"-esque rural comedy of the General Store and Train Station. The Church could be the stately, stone United Presbyterian around the corner. There are no light-holes. No cellophane windows. Just solid cardboard lithos on heavy cardstock bases. Can this be anything but American? 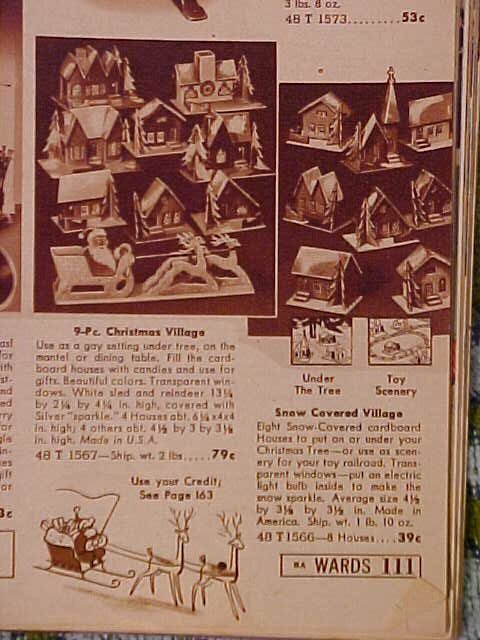 Who made the Pineville Set is a total mystery to me, but here's the set of 8 offered in the 1944 Ward's Christmas Wishbook, establishing absolutely that they were a definite Wartime thing. How long they may have continued to be offered after the war is a guess. But for however long, they must sold a lot of them, because you still find them around here at fleas and antique stores. Here's a personal from me - I was about 5 at the time these memories were being formed. That's 1946. Gosh, I am older than the song "White Christmas" that you hear! ('43) - but I didn't know that; it was the theme of my best Christmases. I am older than "Have Yourself a Merry Little Christmas", "I'll be home for Christmas," and many more. God bless us all - I wish it were always 1946 to 1949...The War did fatal damage to the innocent kind of Christmases we'd had. Things got evermore sped-up and "realistic." Despite a desperate few years creative fight to get it back, -a handful of now-classic movies 1947-49 , the bubble lights and brief resurgence of large houses in the 50s, it was starting to become a thing we hadn't time for. But there is still the music. The music was the spirit - and remains untouchable no matter how much else we seem to lose. The just don't write them like that anymore, and it's just not Christmas without seeing that precious handful of movies for 60th time.. They are the American Christmas as we like to think it is, but hasn't been for many many years ..